2018 is going to be a GREYT year for us all!!! May each one of you be richly blessed with abundant health and happiness. As we all know, THIS is Madiba's 100th year!!! What ELSE can we do to make this the most special year to remember our world icon???!!! We can go for yet another Guinness World Record of course!!! We can go for the "Longest Scarf in the World"!!!!! We have the WOOL. We have the "GOODWOOL" !!!! For the past three years we have churned out THOUSANDS of scarves for our #SSS (Secret Scarves Shhh...) initiative which we do every July during Mandela Month. 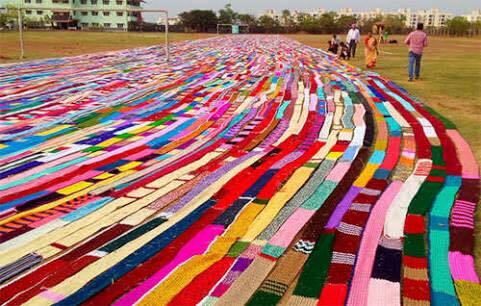 India currently holds the record for the Longest Scarf in the World. Why don't we in South Africa beat India in this "WOOL CUP"???!!!! We should make our deadline June 25th in order to get all scarves to 67 Blankets Headquarters, so that we can begin the task of sewing scarves together and labelling each scarf. We should pin a date in the second week of July - Mandela Month (as we usually do) and display our very long scarf in an area such as Freedom Park, showing the entire world what our 67 Blankets family is doing, stitch by stitch, to keep the legacy of our late great Tata Madiba (and the ideals for which he stood) alive. Once we have achieved our Guinness record and done spectacular aerial photos of this display, we will ask Stuttaford Van Lines to transport scarves back to the regions so that we can carry out our Secret Scarves mission on the same day at the same time, all around our beautiful country. Every scarf will have our message of love and warmth attached to it, as well as our trademark heart logo - and people walking home from school and work will witness pockets of glorious colour and warmth around lamp posts, railings and trees. And thousands of people who need a little more colour and warmth will be able to just help themselves to our labours of love.